The Pink Peony offers many original items for your friends, home and garden, many of which are handmade, either on the premises or by local craftsmen and women, such as Wood Turning, Ceramics, Jewellery, Wooden and Fabric Hearts, Handbags, Cards and much more, all at affordable prices. With an ever changing selection of gifts you are sure to find the perfect present or be tempted to treat yourself. No need to go into town; shopping made easy in a relaxed and stress free environment. Come and take a look! 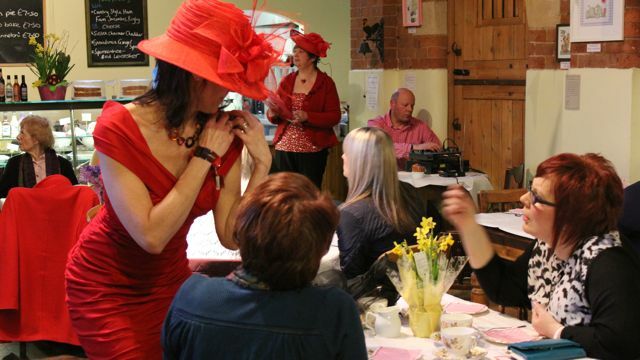 We also sell occasion hats, fascinators and handbags for Weddings and The Races, see pictures of our fashion show in gift/craft. Bring along your outfit, we will help and advise you, adding the finishing touch to complete your desired look.